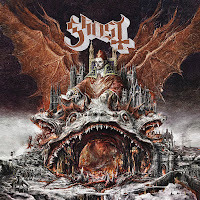 Home / ghost / reviews / Review || Ghost - "Prequelle"
Review || Ghost - "Prequelle"
Ghost will be releasing "Prequelle" (pronounced prē-KWELL), their ambitious fourth psalm studio album on June 1st via Spinefarm/Loma Vista Recordings. 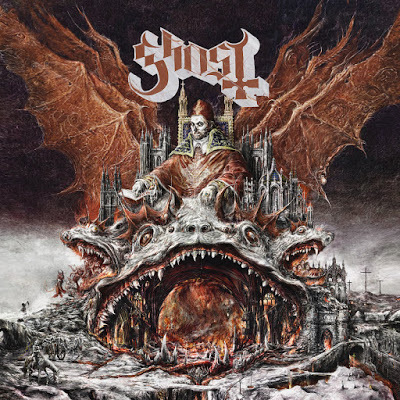 It is the follow-up to the 2016 album, "Meliora", and its accompanying EP, "Popestar". "Prequelle" sees the demise of the Papa Emeritus bloodline, as Papa Nihil is considered too old to lead the band, and new blood was brought in from the clergy; Cardinal Copia. Lyrically, the album deals with grim themes of the plague and the apocalypse, enrobed in a borderline arena rock soundtrack -a ballsy move that seals the band's linear progression. But let's break this down, shall we? There is nothing scarier than little children singing and Ghost mainman Tobias Forge knows it. The eerie choir singing an ominous rendition of "Ring A Ring O' Roses" has a spine-chilling effect as the orchestration transitions to the first single, “Rats”. One of the catchiest tracks of the album, it holds an 80's heavy metal vibe combined with a wonderful dancing tempo (I mean, who can forget Cardinal Copia’s enviable routine on the video?) and that ridiculously contagious “whoa-ah”, fully juxtaposing the morbid lyrics -a prominent pattern throughout the album. "Faith" follows, with a very cynical and omnipotent at this point Cardinal Copia ascending to the papal throne, declaring "Faith is mine". Groovy and quite simplistic in terms of composition, it is guaranteed to make the listeners bob their heads to the rhythm. From the end of the song, we transition to "See the light". The piano accompanying the vocals makes way to a big hard rock chorus, inviting the listener to join the dark communion ("Eat me, drink me"). Expanding over 5', the instrumental "Miasma" features almost prog keyboards "conversing" with the guitar solos. Now usually that would be a no-go for me but I must admit the track kept my interest through every spin -and that saxophone in the end? Brilliant. Entering the second half of the album, "Dance Macabre" continues in this 80's-type hard rock. Besides, the vocal melody and subtle keys in the chorus leave no doubt this could have been a forgotten Bon Jovi bootleg. Between us, that's the thing I like the most about this album. It contains and rebrands cleverly disguised elements of mid-80s pop metal, making even those tough dudes who trash talk AOR music indulge into the ever-so-slight cornyness of these songs. "Pro-Memoria" on the other hand is a beautifully grim power-ballad led by a sombre piano arrangement, efficiently diverting all attention to the lyrics, which in the chorus are further enhanced by a sinister yet subtle organ. The guitar solo and string ensemble lead to an choral outro and to the eighth song, "Witch Image". If you had managed not to imagine Ghost in spandex, big hair, big arena stages, back-on-back guitar solos and scarves hanging from mic stands, I ovate you but I'm afraid that the song will plant this very image in your head. Memorable and rather poignant, it's probably my favorite song on the album. As the end draws nearer, "Helvetesfonster" introduced with a melodic yet slightly creepy piano and flute arrangement. The fervent intro seamlessly changes to keys and drumwork, only for the piano and flute to reappear and momentarily dominate the instrumentation. The guitars and piano entwine in a dramatic duel until an intricately upbeat theme is introduced out of nowhere and for about a minute, until the winter breeze envelops us. Last but certainly not least, "Life Eternal" closes the album in a quite cheesy but beautifully mournful, and almost anthemic, way.